Summary: The Viavito Setry is a 2-in-1 elliptical trainer and exercise bike combo. Like most machines in this category, it is primarily an elliptical – with an added bike option with some simple changes. This is a great looking model, and is flexible too. You’ll get 20 programmes, and up to 4 separate users can store their settings. This mid-range model has 32 resistance levels, a solid 5kg fly wheel and is adjustable enough to suit taller and shorter users. All the feedback at the time of writing has the full 5-stars – check out the gallery and latest feedback for yourself on the dedicated amazon.co.uk product page. 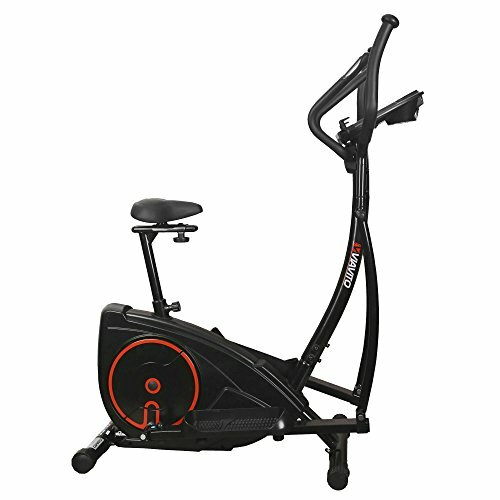 This elliptical trainer looks great, with sleek curves and a distinctive black and red colour scheme. Styling of the tops of the bars and saddle support contribute to the overall looks. This is a sturdy machine compared to many home ellipticals, weighing in at a full 30kg. While it is not as big as those you’ll find in the gym, it is solid enough for home users up to a maximum weight of 120 kgs. With oversized footplates with a special easy-grip surface, this machine has a stride length of 12.3 inches. You can adjust the seat horizontally as well as vertically to find the best spot for using the exercise bike option. This machine comes with a 2 year warranty, as long as you register with the manufacturer. The computer is far better than the equivalents on budget ellipticals. This is a backlit LED display, which is on the larger side. Underneath this you will find buttons for easy adjustments while you are using it. Standard feedback / monitoring includes time, speed, rpm, distance and calories. There is also a pulse rate monitor in one of the poles. The 20 programs include 12 preset options, high intensity and user-defined (programmable) options too). You can set up 4 profiles, and input the gender, age, height and weight for each. If you use pro tracking equipment, this model is also compatible with wireless chest monitors. At the time of writing, there are only 4 pieces of feedback on the amazon.co.uk product page. These all have the maximum 5 stars. It was noted that this product is easy to assemble (this can often be a sticking point). Looking at the Q&A, it comes in 2 boxes, one for the handlebars and saddle plus pole, and the other for the base unit. So far everyone has been delighted – though with a small amount of feedback there is still a chance that we will see a disgruntled customer or two! Overview – Why Choose the Viavito Setry Elliptical Trainer? There are two reasons to choose the Viavito Setry for me. First, this is a great looking machine – especially compared to many of the generic silver / white models out there. Second, it is versatile. The computer gives you a lot of options, the machine itself is fully adjustable, and when you fancy a change-up from cross-training, you can use it as a bike. Check out the full impressive gallery now on the dedicated amazon.co.uk product page.